Retail $14.95 SAVE 64% ! 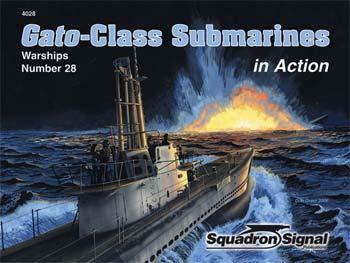 "Sqaudron Signals Gato Class Book"
An informative book on a large class of WWII submarines and its sub-class. Many black-and-white photos give insight to the various differences in the more famous subs in each sub-class. Colored drawings allow the modeller to have some idea on the camouflage schemes from 1941 to modern applications of the Gato. I particularly love the short history leading up to the conception of this favorite American submarine. An excellent staple bound, paperback reference.. Complete coverage of the United States Navy's Gato-class submarines (including Balao and Tench variants).. Detailed photographic coverage from all aspects!. Heavily illustrated with over 100 black-and-white photographs accompanied with detailed captions..
2 pages containing 6 full color profile paintings..